"The City of Westlake, Ohio has limited the length of cul de sacs since 1995 with a requirement that larger subdivisions must be interconnected and that streets can not exceed 1,000 feet or contain more than 25 houses without two street connections from two different directions.This limited any cul de sac to under 1,000 feet maximum. (previously cul de sacs were limited to 500 feet but could get a modification to be longer with no limit. Now modifications are allowed only between 500 and 1,000 feet). The result has been more interconnected streets and subdivisions, reduction of long isolated streets and more connections creating neighborhoods. This was done to eliminate isolated 'lollypop' developments, provide better neighborhoods and provide safety forces, especially fire, with multiple access. This also was supported by other departments including service and school transportation." One other observation. During my cross-country travels on U.S. Route 50, I also heard first hand about the impacts of not requiring street connections between subdivisions. See my post, Connecting in Montrose. When this Montrose subdivision was approved, no connecting street was required to the neighboring development (though space for a future connection was provided). For two other interesting reports on the cul-de-sac debate listen to John Nielsen's report on National Public Radio: Cul-de-Sacs: Suburban Dream or Dead End? 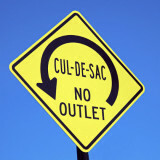 and read Cul-de-sacs are a Dead End, posted on m-bike.org.